Build a tree shaped bookshelf | DIY projects for everyone! This tree shaped bookshelf is a beautiful addition to any room and you can definitely build one yourself! 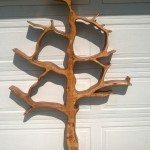 Some of you might have seen tree shaped bookshelves being sold online, and you probably know that they can cost $1,000 and more! But why spend that amount when you can have one for much less by doing it yourself? You don’t need any sophisticated tools or prior experience – just the basic building tools, and some time and patience. Try building a small one first, perhaps for the kids if you have any. This fun-looking bookshelf might even encourage them to read more! And if you really like how it looks, you can make another larger version to put in your bedroom, living room or study room. (We’re pretty sure many of you will love this tree shaped bookshelf ;) ). I would need a forest of them.